The cause of the Great Recession circa 2008 was collapsing home prices that led to an insolvent banking system. However, the next economic crisis will result from the bursting of the worldwide bond bubble and its devastating effect on asset prices. 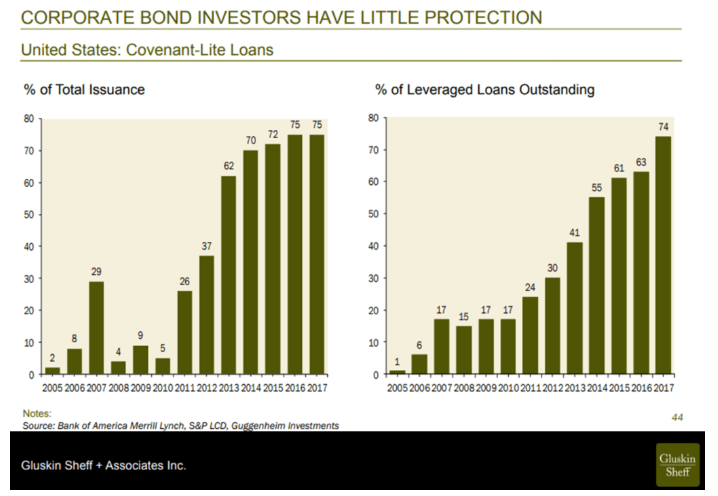 One of the dangers from spiking borrowing costs is the shutting out of distressed corporations from capital markets, which will inhibit their ability to roll over and service existing debt. This will lead to a massive increase in the number of insolvent corporations. We are already beginning to see the fallout from this phenomenon. According to the American Bankruptcy Institute, Chapter 11 bankruptcies spiked 63% year-over-year in March to 770 filings. This is the highest number of filings for any month since April 2011. And, according to Moody’s, defaults in the retail sector reached an all-time high in the first quarter of this year. Even worse, those Bankruptcy filings in March were the second largest year-over-year jump for any month since the Great Recession and is indicative of an economy that has reached the end of its credit cycle. As the Fed continues to push interest rates ever higher, Zombie companies (businesses that can only survive by issuing debt just to pay interest on existing loans) are experiencing greater difficulty keeping these Ponzi Schemes afloat. Brick-and-mortar retailers are the ones hit the hardest; their carnage can easily be witnessed at an empty strip mall near you. And this bond-market bloodbath is spilling over to other industries such as subprime auto-loans, where delinquencies have surged to their highest rate since October of 1996. In the wake of the financial crisis, specialized lenders piled into this market; and yield starved investors sccoped up these loans with alacrity. This year, three of them have gone bust amid rumors of fraud and misrepresentations. And we can expect more to come given that auto-loan delinquencies have been on a steady rise since 2012. At this time, 4.3% of auto debt is at least 90 days past due, which is not too far away from the highest rate seen in the past 15 years of 5.3%. Nevertheless, Corporate America’s addiction to cheap debt is now coming to an end. Over the next five years, Companies will have to refinance close to $4 trillion of bonds--two-thirds of all their existing outstanding debt, according to Wells Fargo Securities. 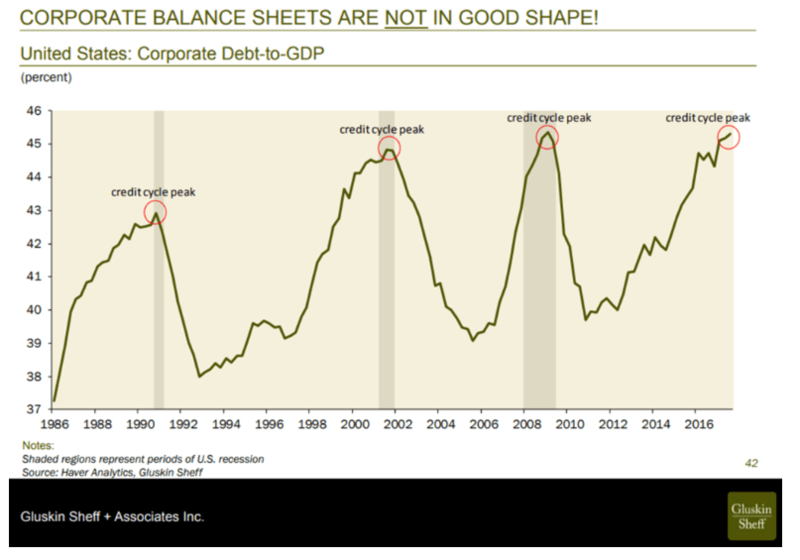 Rising interest rates will push an even greater percentage of these corporate balance sheets upside down. Concerns about the affect corporate debt refinance will have on the economy is not lost on markets. According to a Bloomberg Barclays gauge, corporate bond spreads have surged to a seven-month high. 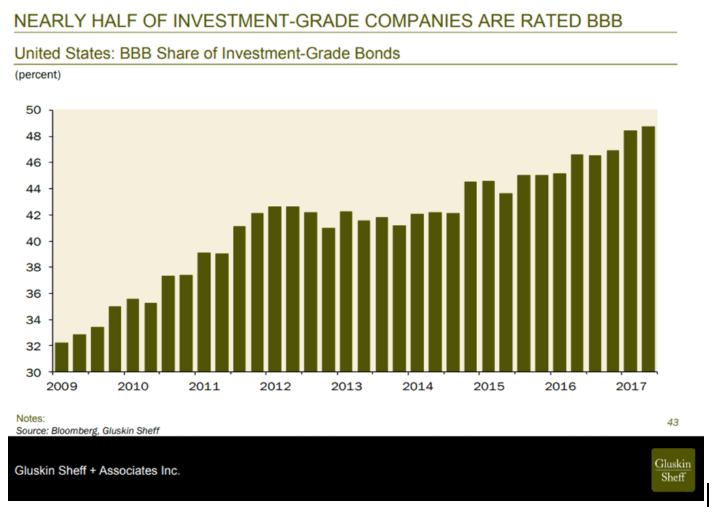 Of the $4 trillion in bonds coming due, $3 trillion of it is rated investment grade. However, this debt is comprised primarily of notes in the lowest rungs in the investment grade category; just above Junk (BBB group-S&P Global Ratings and Baa-Moody’s Investors Service.) And the remainder of the bonds were high-yield corporate debt and leveraged loans. According to New York-based research firm Credit Sights Inc, the high-grade bond market in the U.S. is carrying the lowest credit-quality mix since the 1980s, Leaving Corporate Balance Sheets in bad shape and Corporate Bond Investors with few places to hide. This low quality of corporate debt exists concurrently with a record level of debt as a percentage of the economy. But don’t expect the consumer to rush into corporate debt and prevent borrowing costs from rising. A record level of household debt, rising gas prices and a savings rate that is in the basement of history is hurting consumers’ ability to increase the pace of investing. Household balance sheets are also getting squeezed by the spike in LIBOR, the rate most of their loans are pegged to, which has risen from 0.3 to over 2.3% in the past few years. According to the Federal Reserve Bank of NY and Equifax, US household debt set yet another record high when it reached $13.2 trillion in the first quarter of this year. That is a $63 billion increase from the previous quarter, and half a trillion dollars higher than its previous peak in 2008. According to the Nilson Report, credit card spending soared 9.4% last year, to $3.5 trillion. And with those rising rates, delinquencies are also spiking right on cue. Student loan debt has also ballooned over the past decade to over $1.3 trillion, surpassing all categories of household debt other than mortgages. The rise in rates has consumers reconsidering how to finance their mortgages. According to Inside Mortgage Finance, ARM originations jumped 40.5% in the second quarter of 2017. ARMs now represent 9.5% of all active loans according to the mortgage analytics firm Black Knight. But in the jumbo market--whose mortgage value is over $435,000 --ARM’s comprise nearly 25% of the market, and that share is quickly growing. Of course, the end of the nearly 40 year old bull market in bonds also means that the ability to refinance a mortgage is quickly becoming extinct. U.S. mortgage applications to refinance an existing home fell to their lowest level in nearly 18 years as borrowing costs climbed to their highest levels in over seven years. This also means consumers’ multi-decade habit of restructuring these loans at a lower rate and to take out cash at the same time is also a thing of the past. For most consumers, the rise in debt payments is offsetting any positive cash flow received from tax cuts and wage growth. Personal savings as a share of disposable income is falling rapidly and is hovering down at 2007 levels. These are all important metrics to consider since consumers comprise roughly 70% of the overall economy and are a significant driver of economic growth. And rising rates is also putting pressure on the U.S. government’s balance sheet, as the National debt reached a new milestone of over $21 trillion. Our National debt increases by about $17,000 every second; and with the D.C. swamp in spending overdrive it is only getting worse. The ratio of National debt to GDP currently stands at over 105%. Back in 1981, the national debt comprised a mere 31% of GDP. But this isn’t slowing down the pace of borrowing from the Treasury Department, which has plans to borrow $1 trillion this year--an 84% jump from last year’s deficit. The current regime of the Federal Reserve is the most hawkish in history. The members of the FOMC are in the middle of raising the Fed Funds Rate several times each year, while at the same time it is selling $600 billion worth of bonds each year. This is occurring at the same time debt levels are at an all-time high, along with asset prices at all-time highs. The next financial crisis is going to be more severe than the Great Recession because all asset prices are in a bubble this time around. And, at the same time, public, private and central bank balance sheets are in much worse condition than a decade ago. In the wake of the last crisis, Governments worldwide thought it was a great idea to push trillions of dollars’ worth of debt into negative territory and keep them there for many years in the foolish pursuit of inflation targets. But now, global bond yields are in the process of spiking and this will for sure be the catalyst for the next financial panic. Wise investors should already have a plan in place to protect their investments. And to profit from the imminent financial crisis that will send asset prices into freefall; perhaps with even greater intensity than ever seen before. ORDERS CANNOT BE TAKEN VIA E-MAIL. PLEASE CONSULT YOUR BROKER OR DELTA’S HOME OFFICE TRADING DESK AT (800)649-4554. Delta Equity Services Corporation e-mail system is for business purposes only. Messages are not confidential. All e-mail may be reviewed by authorized supervisors, compliance or internal audit personnel. E-mail may be archived for at least three years and may be produced to regulatory agencies or others with a legal right to access such information. Delta Equity Services Corporation does not represent or endorse the accuracy, timeliness or reliability of any of the information and/or opinions provided by registered representatives and third-parties. It is not a solicitation or an offer to buy or sell any public or private securities of any kind. PAST INVESTMENT PERFORMANCE IS NOT INDICATIVE OF FUTURE RESULTS. SECURITIES OFFERED THROUGH DELTA EQUITY SERVICES CORPORATION, 579 MAIN STREET, BOLTON, MA 01740, (800) 649-3883. MEMBER NASD, SIPC, AND MSRB.